The whole of Sweden's population has followed this show on TV. More than 70,000 have so far have seen them live. But it is just a handful who have gotten to challenge them. Now the chance has come to you to challenge them hard on their own home arena. The gladiators is a battle game where you can try on branches like the wall and duel in all the branches you play meets you gladiators. 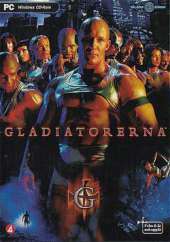 There are twelve different gladiators: Hero who is the captain of the male gladiators, Pyhton, Plexus, Izor, Phoenix, Raptor, Etna who is the captain of the female gladiators, Blade, Amazon, Elektra, Troy and Amber. There are five different branches that you can compete in. The wall: where you have to climb a 11m high wall but you do not climb alone, shortly after the start a gladiator follows and tries to stop you if you reach the top before the gladiator takes you have won. The duel: you and the gladiator stand on each platform across the ground, if you manage to bring down the gladiator with your club before he / she gets you down you have won. The pendulum: here you will cross a bridge to another platform to leave and collect balls, next to the bridge are four gladiators and swing large silver balls on you, it is to get as many balls on the other side and put them in a basket before the gladiators strike you down. The grill cages: now you run in a cage and hit as many tiles in the ground as possible but there are three gladiators who are also in cages and they should prevent you from hitting the plates. The obstacle course: this is the last branch, it is about getting through an obstacle course in as short a time as possible consisting of ten parts, the one that first comes into the goal wins. You can play in three different ways. Training: here you can train on all the different branches. Program: here you play in the same way as in a real TV program. Season: Here you play first quarter finals late semifinals and one final.